With Regina relocating to East Riverside, Toby, Lily, and Carlton are free to move into the guest house. Things seem to be going great for the family now that Lily’s returned to her job at UMKC’s Office of Disability Services, but Toby feels unfulfilled in his own professional life. He’s no longer sure his passions lie with DJ-ing, and after he encounters two friends with Down syndrome at a cafe, he starts thinking about a career in education and advocacy on behalf of people like his son. An enthusiastic Lily says she can get him into classes at UMKC while he figures out exactly what he wants to do. Toby isn’t the only one considering a new job in the Switched at Birth series finale! After Melody is asked to become Dean of Student Affairs at Gallaudet, the prestigious university for the deaf and hard of hearing, she and Gabe prepare to move to D.C. But is she really ready to give up her life in Kansas City? Upon finding out that former UMKC deaf program student Matthew was kicked out of home for being gay, Melody invites him to stay with her – just as she did for Travis in season 2. Ultimately, Melody passes on Gallaudet after realizing she’s more needed at UMKC. In Switched at Birth 5×09, John got Travis a spot on a professional baseball team… in Japan. In the Switched at Birth series finale, Travis decides to take the offer – and he wants Bay to go with him. Bay is unsure, but gets an idea after hearing Emmett’s plan of moving to D.C. with Gabe and Melody has fallen through. She compares Travis and Emmett to herself and Daphne – not related by blood, but still family – and suggests Emmett accompany Travis to Japan. Emmett agrees, acknowledging, “I need a change. If I know anything, I know that.” When he and Bay meet to discuss the trip, Bay tells him she’s confident his photojournalism career will take off and “I’ll get to say, I knew him; he was my first love.” As for Bay herself, she declines to go to Japan in order to focus on building her career as a tattoo artist in Kansas City. 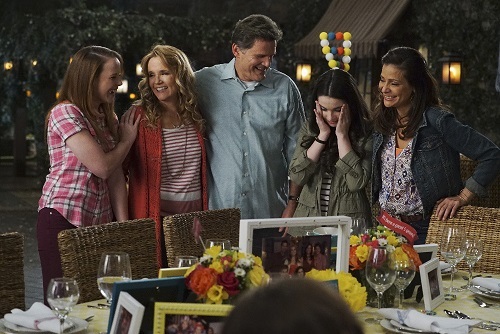 The Switched at Birth series finale falls on the five-year anniversary of the Kennishes finding out about the switch – or does it? While putting together a scrapbook to mark the occasion, Kathryn finds a DNA test ordered by John. Turns out he suspected he wasn’t related to Bay, but never shared the results of the test because he thought his wife had an affair. A month later, they got the news about the switch, and five years later, the whole truth finally comes out! The Switched at Birth series finale also sees John protesting – and eventually accepting – Bay’s career choice. Meanwhile, Kathryn supports Daphne through her doubts about becoming a doctor and tells John to let their daughters make their own choices. In addition to settling things with Emmett and pledging to make her relationship with Travis work long-distance, Bay is being featured in Live Ink magazine! However, John’s more focused on whether she’s getting paid than the fact that her art is being showcased. Noelle suggests Bay take her career to the next level by tattooing a big name, then talks her up to celebrity Jordan DeVille at a Live Ink party. The validation from Noelle is exactly what Bay needs to stand up to John, who admits he’s concerned he has no strings to pull for her in the industry. She assures him she can make her own way, and they finally bury the hatchet. After Daphne reconnects with Mingo while vying for a paid internship with an orthopedic surgeon, they eventually realize they’re both single and finally get back together. However, there’s one major down side: Dr. Bannon immediately writes off Daphne for being deaf, telling her, “You can’t be deaf and be a surgeon, obviously.” After pep talks from Kathryn and Regina – and with moral support from Iris and Mingo – Daphne confronts the doctor and accuses him of violating the Americans with Disabilities Act. In the last scene of the Switched at Birth series finale, the Kennish-Vasquez clan gathers for what Kathryn dubs a DNA party, and Regina says it best: “This has been an amazing five years.” Then, the family heads out to the front lawn for the once-in-a-lifetime opportunity to watch a rare comet streak overhead. We chatted with Katie Leclerc (Daphne Vasquez) and Vanessa Marano (Bay Kennish) to get their take on the Switched at Birth series finale, find out how they picture their characters’ futures, and see if they’d be on board for a Switched at Birth revival! Check out the interview, and let us know your favorite Switched at Birth moments in the comments!